Green: the color of trees, cash and your new favorite automotive gauges. 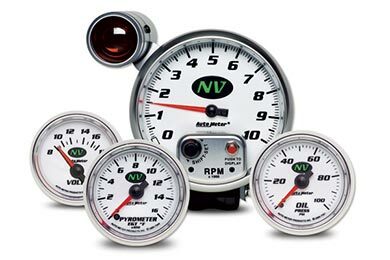 AutoMeter NV Gauges feature bright white faces illuminated by intense green LED lighting. Perfect for monitoring your stats, these gauges also give the green light on style. AutoMeter's been delivering critical vehicle information to racers, drivers and pit crews for over 50 years. These high-tech dashboard devices are race-proven in the toughest venues: NASCAR, NHRA, Baja, Off-Shore Marine, Bonneville and everywhere races are won. Your vehicle's dash is prime real estate. Only use the best for tracking vital statistics that make or break the race. AutoMeter's diverse line-up of top-quality gauges is ready to meet the demands and rigors of your ride. What's more, your AutoMeter NV Gauges are backed by a 1-year warranty. WARNING: This product can expose you to chemicals which are known to the State of California to cause cancer. For more information, visit www.p65warnings.ca.gov. Works well. Easy to install. Always have loved autometer guages, since ive had my diesel pickup i have autometer guages in it, trans temp, boost,pyro, never had a issue with them and they are very steady and seem to be really accurate! Best guages in my opinion! I installed these in a semi truck. They look good and function well. So I guess they do what the say! Reference # 766-633-179 © 2000-2019 AutoAnything, Inc.